Aaron has made a commitment to corporate responsibility and promoting good environment managed practices, including helping our customers dispose of waste in a responsible manner. With Aaron Air™ Toner Recycling, do your part to preserve the environment and protect our nation’s land, water, and air from harmful waste. 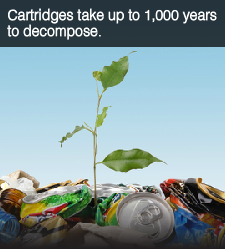 If all empty toner cartridges thrown away each year were stacked end to end, they would circle the earth. Collect: Collect empty inkjet and toner cartridges instead of disposing of them. Place: Put your empty cartridges in our free GreenBox shipping boxes. Each box holds 8-10 toners and includes a free shipping label. When the box gets full, you can easily order additional boxes through your Aaron Activate™ Interface. Pickup: Send it out with your daily pick-up or drop off at your nearest UPS office – and that’s it. Get Recognized: For involvement in the Air™ Toner Recycling Program, your organization will receive a certificate recognizing your organization’s commitment to preserving the environment. Display proudly publicly or place on your website to be recognized for your contribution! It’s that simple. Click here to contact an Aaron representative today to get started!